The war years were an exciting time for a child, even in north-west London which was generally out of the action. Milestones were the blitz at the beginning of the war (I remember being held up, at the age of five, to see London – 15 miles away – burning in December 1940) to the arrival of the ‘doodlebugs’ and V2 rockets toward the end. Between these events we were occupied with school and marching up and down the street singing songs about the testicular abnormalities of Adolf Hitler and his friends. The real excitement, of course, was when the primary school received a direct hit from an incendiary bomb. 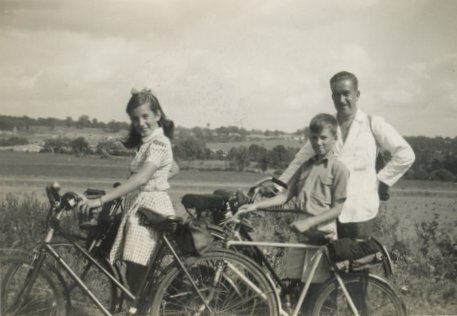 By 1948, when I was thirteen, I had acquired my first full-sized bicycle, an electric blue Dawes, of which I was immensely proud - as this photograph shows. 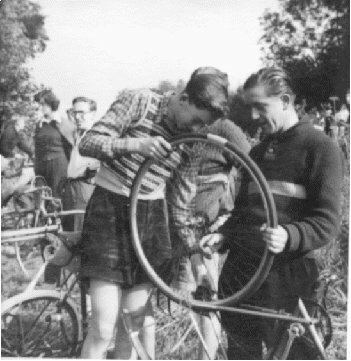 In March 1949 I joined the Northwood Wheelers along with my friend Brian Huggins and started going on club runs. I had been aware of Brian since we were in the primary school together. 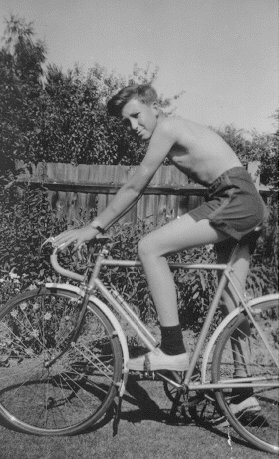 We then moved on to grammar school where we became close through our mutual interest in cycling. Brian has remained an active cyclist since our school days, and he still comes up to Scotland most summers to ride the highways and byways of the Lothians, Fife and Borders. In 1949 I also tried my hand at time-trialling. The club had measured a somewhat hilly 10-mile course through Harefield, starting near Batchworth Heath. My first efforts were not bad for a 14-year old: my records show that I achieved a fastest time of 32 minutes. The Junior 10-mile championship was held on October 2nd 1949. I seem to have suffered with a time of 33m 50s – but I was not the slowest! The event was won by Pete Kibbles with a time of 27 m 26 s. Among the finishers were my friends – Tony Standing with 28m 50s, Brian with 30m 24s, and Jeremy Sexton with 32m 15s. The results sheet is reproduced below. What is extraordinary is that a club could muster a field of 22 junior riders. Today many clubs have no juniors at all, and time-trialling is the pursuit of the over forties! To put these results in context, today’s competition record for 10 miles is 18 m 27 s by Graeme Obree, and a good clubman can expect to do a ‘22’ or a ‘23’. Very few Silverlights were made, probably a total of less than 500 between the late 1940s and 1958 when production ceased. This makes them a very rare item today. I rode my Silverlight until about 1953 when I sold it to a club-mate. I regretted this sale for decades thereafter, but have recently (February 2000) managed to locate a replacement 50 years after the first purchase – at a price more that 40 times the origina l!